Whether you are a pharmacist, ID specialist, microbiologist, pharmacy student or anyone who is interested or reviewing antibiotics I will put here the MUST know tips, facts and notes about Antibiotics. You can use these facts for fast reviewing antibiotics, they cover almost every single antibiotic class with very important notes and tips that should be remembered. Transfer of DNA by plasmid conjugation. Transfer of DNA by bacteriophage transduction. Transfer of naked DNA by transposon transformation. 2. Under the selection pressure of antibiotics, the question is not whether, but when resistant bacteria will take over. 3. MIC : is the minimum inhibitory concentration. All contain a lactam ring. All bind to and inhibit penicillin-binding proteins, enzymes important for cross-linking bacterial cell wall peptidoglycans. All require active bacterial growth for bactericidal action. 5. Allergic reactions are most common b-lactam antibiotics toxicity, and they include both delayed and immediate hypersensitivity reactions. 6. Seizures are associated with Penecillins and imipenem ( a carbapaenem), primarily in patients with renal dysfunction. 7. Pseudomembranous colitis can develop as a result of overgrowth of Clostridium difficile. 8. Natural Penicillins have a very short half life. 9. The enzyme DNA polymerase is responsible for replicating the bacterial chromosome, but other enzymes are also required for this process. 10. MIC measures the minimum concentration of antibiotic that is still able to suppress growth of the bacterial isolate. 11. MBC is the minimum concentration of antibiotic that results in killing of the bacterial isolate. 12. 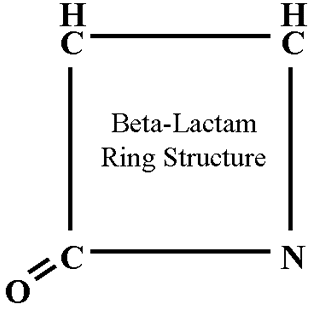 The essential core of penicillin is a four-member ring called a lactam ring. 13. Intrinsic resistance refers to a resistance mechanism that is intrinsic to the structure or physiology of the bacterial species. 14. Acquired resistance occurs when a bacterium that was previously sensitive to an antibiotic acquires a mutation or exogenous genetic material that allows it to now resist the activity of that antibiotic. 15. Natural penicillins: Penicillin G (Parenteral) & Penicillin V (Oral). 16. Aminopenicillins: Ampicillin & Amoxicillin. 17. Extended-spectrum penicillins with B-lactamase inhibitors : Piptazo & ticarcillin-clavulanate. 19. Aminopenicillines are with additional amino group in their side chain increases their hydrophilicity and allows them to pass through the porins in the outer membranes of some enteric gram-negative rods, such E. coli, P. mirabilis, S. enterica, and Shigella spp. 20. The cephalosporins received their name from the fungus Cephalosporium acremonium. 21. First generation cephalosporins include: Cefazolin, Cefadroxil & cephalexin. 22. Second generation cephalosporins: Cefotetan, cefoxitin, cefuroxime, Cefaclor, cefprozil, cefuroxime axetil & loracarbef. 23. Third generation cephalosporins: Cefotaxime, ceftazidime, ceftriaxone, Cefdinir, cefditoren, cefpodoxime proxetil, ceftibuten & cefixime. 24. Fourth generation cephalosporins: Cefepime. 25. Fifth generation cephalosporins: Ceftroline (has MRSA overage). 26. First-generation cephalosporins have good activity against aerobic gram-positive bacteria. 27. Second-generation cephalosporins have modest activity against aerobic gram-positive, aerobic gram-negative, and (in some cases) anaerobic bacteria. 28. Third-generation cephalosporins have strong activity against aerobic gram-negative bacteria. 29. Fourth-generation cephalosporins have especially enhanced activ- ity against aerobic gram-negative bacteria. 30. Fifth-generation cephalosporins have strong activity against aerobic gram-negative bacteria and excellent activity against aerobic gram-positive bacteria. 31. Carbapenems : imipenem, meropenem, doripenem, and ertapenem. These molecules are quite small and have charge characteristics that allow them to utilize special porins in the outer membrane of gram-negative bacteria to gain access to the PBPs. The structures of the carbapenems make them resistant to cleavage by most B-lactamases. The carbapenems have an affinity for a broad range of PBPs from many different kinds of bacteria. 33. Imipenem was the first commercially available carbapenem in the United States. 34. Imipenem is rapidly destroyed in the kidney by an enzyme called dehydropeptidase I.So it is administered with cilastatin, an inhibitor of this enzyme. 35. Meropenem has a methyl group, which makes the molecule resistant to cleavage by the renal dehydropeptidase. As a result, meropenem does not need to be administered in conjunction with cilastatin. 36. Carbapenem use is associated with several adverse events, including nausea and vomiting, diarrhea, rash, and drug fever. 37. Patients with preexisting central nervous system disease and with renal insufficiency are most at risk of seizures and should be given carbapenems with caution. 38. Aztreonam, the only commercially available monobactam and available for parenteral use only. 39. Aztreonam has activity against aerobic gram negative bacteria but is not useful against gram positive or anaerobic bacteria. It is a relatively safe drug and can be used in individuals with allergies to other b-lactam agents. 40. Glycopeptide: Vancomycin and Telavancin are two members of this group. 41. Glycopeptides are poorly absorbed in the gastrointestinal tract, so these agents must be given intravenously. 42. Glycopeptides activity is restricted to gram positive organisms. 43. Vancomycin and telavancin are active against nearly all staphylococci and streptococci including MRSA. 44. Glycopeptides kill bacteria by preventing synthesis of the cell wall. They bind to the d-alanyl–d-alanine portion of the peptide side chain of precursor peptidoglycan subunits. 45. Rapid infusion of Vancomycin has been associated with “red man” syndrome, in which patients develop pruritus and an erythematous rash on the face, neck, and upper torso. 46. Vancomycin is a nephrotoxic agent. 47. Daptomycin is a novel cyclic lipopeptide antibiotic. 48. Daptomycin has poor activity in the lungs and should not be used to treat pneumonia as it is deactivated by lung surfactants. 49. Daptomycin is active against many aerobic gram positive bacteria, including highly resistant strains such as MRSA, penicillin-resistant S. pneumoniae, and some vancomycin resistant enterococci (VRE). 50. Colistin: belongs to the polymyxin group of antibiotics. 51. The rifamycins consist of rifampin (also called rifampicin), rifabutin, rifapentine, and rifaximin. 52. The rifamycins are “accessory” antibiotics, these antimicrobial agents are added to traditional treatment that require a little accentuation for the optimal effect. 53. Rifamycins act by inhibiting bacterial RNA polymerase. They nestle deep into the DNA/RNA tunnel of this enzyme and, once lodged in this position, sterically block elongation of the nascent mRNA molecule. 54. Because single mutations are sufficient to lead to resistance, rifamycins are usually used in combination with other agents to prevent the emergence of resistant strains. 55. Rifampin is also effective as monotherapy for prophylaxis against Neisseria meningitidis and Haemophilus influenzae. 56. Rifampin is the oldest and most widely used of the rifamycins. It is also the most potent inducer of the cytochrome P-450 system. 57. Rifapentine has a long serum half-life, which has led to its use in once-weekly regi- mens for immunocompetent patients with tuberculosis. 58. The aminoglycosides are among the oldest antibiotics, dating back to the purification of streptomycin from the bacterium Streptomyces griseus. 59. The name aminoglycoside is derived from the amino groups and the glycosidic linkage. 60. the aminoglycosides have excellent activity against aerobic gram negative bacteria because their size does not prevent their passage through the bacterial outer membrane. (Unlike Vancomycin, only one-third the size of vancomycin). Decreased accumulation within the bacterium, which most likely reflects the presence of efflux pumps. Bacterial enzymes such as acetyltransferases, nucleotidyltransferases, and phosphotransferases, which modify the drug and prevent it from binding ribosomes. Gram-positive bacteria: used synergistically against some: Staphylococci, Streptococci, Enterococci and Listeria monocytogenes. Gram-negative bacteria : Haemophilus influenzae, Enterobacteriaceae and Pseudomonas aeruginosa. Mycobacteria: Mycobacterium tuberculosis and Mycobacterium avium complex. 63. Streptomycin is the oldest aminoglycoside and is rarely used today. It is still a second-line agent in the treatment of tuberculosis. 64. Gentamicin is the most commonly used of the aminoglycosides. It is active against both aerobic gram-negative and aerobic gram-positive bacteria. 65. Tobramycin has the same spectrum of activity as gentamicin. In general, most gentamicin-resistant strains also lack susceptibility to tobramycin. 66. Tobramycin has no activity against enterococci and should not be used for infections caused by enterococci. 67. Certain strains of aerobic gram negative bacteria that are resistant to both gentamicin and tobramycin may remain sensitive to amikacin. However, amikacin has no activity on enterococci like tobramycin. 68. Aminoglycosides are nephrotoxic and ototoxic agents. 69. The macrolide group of antibiotics consists of erythromycin, clarithromycin, and azithromycin. 70. All macrolides consist of a large cyclic core called a macrocyclic lactone ring. 71. Macrolides are protein synthesis inhibitors, they bind tightly to the 50S subunit of the bacterial ribosome at a location that blocks the exit of the newly synthesized peptide. Inhibition of drug entry and its accumulation. Enzyme-mediated ribosome binding site alteration. Mutation of the ribosome binding site (Rare). 73. Parenteral Macrolides : Erythromycsin and Azithromycin. 74. Oral Macrolides : Erythromycin, Azithromycin and Clarithromycin. 75. Erythromycin is the prototype of macrolides and is being replaced with the newer agents. 76. Clarithromycin (Klacid) has somewhat greater activity against aerobic gram-positive bacteria and H. influenzae than erythromycin. 77. Azithromycin is highly accumulated in the body tissues, and then slowly released over subsequent days so it is given as once daily dosing. 78. Tetracycline that are being used nowadays: Tetracycline, Doxycycline and Minocycline. 79. Tigecycline is a new novel broad spectrum antibiotic related to tetracycline in structure but with broader spectrum and circumvent tetracycline known bacterial resistance mechanisms. 80. Tetracycline as well as glycylcycline are protein synthesis inhibitors, they act by binding to the 30s ribosomal subunits. 82. Tetracyclines are active against some aerobic gram positive bacteria, such as S. pneumoniae, and some aerobic gram negative bacteria such as H. influenzae and N. meningitidis and some anaerobic activity and can be used to treat infections caused by some spirochetes, such as Borrelia burgdorferi and Treponema pallidum. 83. Tetracycline was discovered in 1953, it is the prototype and available in oral form. 84. Doxycycline has longer half life so it is used twice daily. 85. Minocycline has an activity against MRSA as well as Mycobacterium leprae (used in leprosy). 86. Tigecycline is a broad spectrum antibiotic, used in MDR infections. Tigecycline has an activity against MRSA. However it has no activity against 3Ps (Proteus, Providencia, and Pseudomonas). 87. Tigecycline approved for two indications : Complicated Intraabdominal infections and complicated skin and skin structure infections. 88. Tetracycline as well as glycylcyclines share the same toxicity: discoloration of teeth, photo-sensitivity and hypersensitivity reactions. 89. Blue-black hyperpigmentation of skin and mucous membranes observed relatively frequently with minocycline use. 90. FDA black box warning, all cause mortality is associated with use of Tigecycline. 91. Chloramphenicol is a very old antibiotic, it exerts protein synthesis inhibition activity by binding to 50S ribosomal subunit. 93. Chloramphenicol is effective against many aerobic gram positive streptococci, including a high proportion of S. pneumoniae and S. pyogenes strains. Many aerobic gram negative bacteria, including strains of H. influenzae, Neisseria spp., Salmonella spp., and Shigella spp. Against Anaerobic bacteria like Bacteroides fragilis and some Clostridium spp. Atypical bacteria, including Chlamydia trachomatis, M. pneumoniae, and Rickettsia spp. 94. Chloramphenicol commonly causes reversible dose dependent bone marrow suppression during the course of therapy. 95. Gray baby syndrome is caused by chloramphenicol if used in neonates. 96. Lincosamide antibiotics are : Clindamycin and Lincomycin. 97. Clindamycin, which is available in both oral and intravenous forms, is commonly used today. 98. Clindamycin has an activity against community acquired MRSA infections. 99. The lincosamide antibiotics bind to the 50S subunit of the bacterial ribosome and inhibit protein synthesis. 101. The major toxicity of clindamycin, which has limited its use, is the occurrence of Clostridium difficile colitis. Clindamycin kills many components of the normal bacterial flora in the bowel, allowing for over- growth by C. difficile, which is resistant to this drug. 102. Oxazolidinones are Linezolid and Tedizolid. Please read this Is Tedizolid really an alternative to Linezolid ? 103. Oxazolidinones are completely synthetic compounds. 104. Oxazolidinones bind with 50S subunit of the bacterial ribosome, they prevent the association of this subunit with the 30S subunit, thus precluding ribosome assembly. 105. Linezolid has excellent activity against most aerobic gram positive bacteria, including MRSA, penicillin-resistant S. pneumoniae, and vancomycin resistant enterococci (VRE). 106. Linezolid is available in both oral and intravenous formulations and achieves similarly high serum levels (100% bioavailability) when given by either route. 107. Linezolid use is associated with duration dependent thrombocytopenia, anemia and leukopenia. These side effects are usually reversible. 109. Nitrofurantoin belongs to nitrofurans, as it is highly accumulated in urine it is used in acute cystitis. 110. Nitrofurantoin MOA is not fully understood, it may bind ribosomes and inhibit translation. 111. Nitrofurantoin has activity against many of the organisms that commonly cause urinary tract infections, including aerobic gram negative bacteria (except Proteus spp. and P. aeruginosa) and aerobic gram positive bacteria, such as enterococci and Staphylococcus saprophyticus. 112. Nitrofurantoin is only available in oral form. 113. Sulfa-drugs that might be used nowadays : trimethoprim-sulfamethoxazole, sulfisoxazole and dapsone. 114. Sulfisoxazole usually mixed with Erythromycin to treat otitis media in children. 115. Trimethoprim is not a sulfa drug but acts on the same general pathway as these drugs. 116. Trimethoprim-sulfamethoxazole is a combination of two antimicrobial agents, it inhibits bacterial growth by preventing the synthesis of tetrahydrofolate (THF) which is the active form of folic acid. 117. THF (tetrahydrofolate) is an essential co-factor for metabolic pathways that generate deoxynucleotides, which are the building blocks of DNA. 118. Sulfamethoxazole has the same mechanism of inhibiting the THF synthesis but through competing with para-aminobenzoate (PABA) in the THF synthesis pathway. 119. Trimethoprim, is a structural analog of dihydrofolate and therefore inhibits dihydrofolate reductase, which is required for conversion of dihydrofolate to THF. Alteration of their target enzymes. Changes in permeability that prevent the accumulation of the antibiotics within bacteria. Overproduction of para-aminobenzoate (PABA) which at high concentrations is capable of successfully competing with sulfamethoxazole for dihydropteroate synthase, resulting in sulfamethoxazole resistance. 121. Dapsone is a second sulfa drug that is frequently used today. Its structure is related to that of sulfamethoxazole. 122. Dapsone’s use as an antibacterial agent is limited to the treatment of leprosy, which is caused by Mycobacterium leprae. 123. Trimethoprim-sulfamethoxazole is associated with gastrointestinal effects as well as fever, rash (including Stevens-Johnson syndrome), leukopenia, thrombocytopenia, hepatitis, and hyperkalemia. 124. HIV-infected individuals are particularly prone to trimethoprim-sulfamethoxazole toxicity. 125. Dapsone causes similar adverse effects and, in addition, has been associated with hemolysis and methemoglobinemia. 126. Dapsone is an agent of choice for leprosy. 127. Quinolones are ciprofloxacin, levofloxacin, ofloxacin, moxifloxacin, and gemifloxacin. 130. Resistance to quinolones rises from mutations that occur in specific regions of the genes encoding DNA gyrase and topoisomerase IV as well as efflux pumps. 131. The quinolones have broad activity, they are highly active against the Enterobacteriaceae, Haemophilus spp., and Neisseria spp. also effective against some staphylococci and streptococci, many atypical bacteria, and even some mycobacteria. 132. Ciprofloxacin is one of the oldest fluoroquinolones still in common use. 133. Ciprofloxacin is the most potent of the quinolones against aerobic gram-negative bacteria and is effective against Pseudomonas aeruginosa. 134. levofloxacin and ofloxacin are very closely related. 135. Ofloxacin is a racemic mixture of an active and an inactive stereoisomer, whereas levofloxacin is composed solely of the active stereoisomer. 136. Relative to ciprofloxacin, levofloxacin has enhanced activity against aerobic gram positive bacteria and is effective in the treatment of severe infections caused by S. pneumoniae, including those strains that are penicillin resistant. 137. Moxifloxacin, and Gemifloxacin, have enhanced activity against S. pneumoniae and atypical bacteria. 138. Moxifloxacin contains a methoxy group at R2, which increases potency against anaerobic bacteria. 139. Quinolones cause cartilage abnormalities, so they should be avoided when possible in children younger than 18 years of age and not used at all in pregnant women. Achilles tendon rupture has been reported in the elderly. 140. Quinolone use has been associated with prolongation of the QT interval on electrocardiograms. 141. Metronidazole (Flagyl) is an important antibiotic for the treatment of the anaerobic bacterial infections. 142. Metronidazole has a nitro group in its structure that extends from the core five-membered ring , this group must be reduced for metronidazole to be active. Its like a Prodrug. 143. Once reduced and Metronidazole became activated, the nitro group is thought to form free radicals that lead to breaks in DNA molecules and subsequent bacterial death. 144. Resistance to metronidazole is rare among obligate anaerobic bacteria. 145. Metronidazole is effective against nearly all anaerobic gram negative bacteria, including Bacteroides fragilis, and most anaerobic gram-positive bacteria, including Clostridium. 146. Metronidazole is available in both oral and IV formulations. 147. Metronidazole is used in the triple therapy of microaerophilic bacteria H.pylori. 148. Metronidazole is associated with unpleasant metallic taste and furring of the tongue. 149. Tuberculosis is caused by Mycobacterium tuberculosis. 150. The disfiguring disease leprosy is caused by Mycobacterium leprae. 151. Agents commonly used to treat mycobacterial infections include isoniazid, rifampin, rifabutin, pyrazinamide, ethambutol, clarithromycin, and azithromycin. 152. Isoniazid has little activity against most bacteria but is capable of killing both intra- cellular and extracellular M. tuberculosis. 153. Isoniazid inhibits an enzyme essential for the synthesis of mycolic acid, an important constituent of the M. tuberculosis cell envelope. (isoniazid is specific for mycobacteria because other bacteria do not make mycolic acid). Mutations in the gene that encodes catalase-peroxidase, which is required to convert isoniazid to its active form. Mutations in the gene encoding the target enzyme essential for mycolic acid synthesis. 155. Isoniazid is associated with rash, hepatotoxicity, and peripheral neuropathy. ( pyridoxine prevents neuropathy). 156. Pyrazinamide targets an enzyme essential for the synthesis of mycolic acid. This agent only kills mycobacteria at acidic pH. 157. Resistance to Pyrazinamide results from mutations in the gene encoding pyrazinamidase, an enzyme essential for converting pyrazinamide into its active form. 158. Ethambutol targets an enzyme involved in the synthesis of the mycobacterial cell wall. 159. The major toxicity of Ethambutol is optic neuritis, which may lead to decreased visual acuity and red–green discrimination. 160. Agents with activity against most gram positive bacteria are B-lactam/ B-lactamase inhibitor combinations, carbapenems, glycopeptides, streptogramins, linezolid, and daptomycin. 161. Carbapenems (Imipenem and Meropenem) and B-lactam/ B-lactamase inhibitor combinations are not active against methicillin-resistant Staphylococcus aureus (MRSA). 162. Resistance to linezolid and daptomycin ( for VRE treatment) has already been reported among gram positive bacteria. 163. Aerobic gram negative bacteria are hard to treat, and a large number of antimicrobial agents have been developed to target this type of bacteria. 164. Checking your hospital antibiogram is crucial for proper selection of the treating Antibiotic. 165. Antimicrobial stewardship is a must to control the emerging resistance within any hospital setting. 167. In clinical practice, a large variety of factors enter into the decision of which antimicrobial agent is prescribed for a particular patient. 168. The cell envelope is a protective layer of armor that surrounds the bacterium and allows it to survive in diverse and extreme environments. 169. The cross linking of peptidoglycan is mediated by bacterial enzymes called penicillin-binding proteins (PBPs). 170. Some bacteria are rod shaped and referred to as bacilli. Cocci are spherical in shape. 171. Coccobacilli have a morphology that is intermediate between that of bacilli and cocci. While, spirochetes have a corkscrew shape.